Beginning in the Spring of 2018, at the conclusion of the first year of what was then the Department’s new M.A. 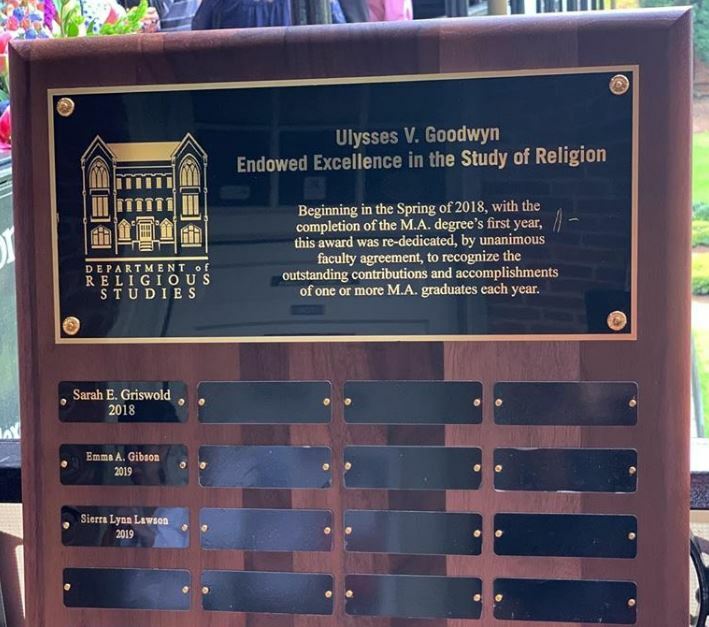 degree, the Department’s longstanding Ulysses V. Goodwyn Endowed Excellence award was re-dedicated, by unanimous faculty decision, to recognize the outstanding contributions and academic accomplishments of one or more M.A. graduates. Prior to that (from 1996-2002), it was the Department’s sole undergraduate award and, from 2003-2018, it assisted the Religious Studies Student Association to fund its events. Along with the recipient’s name appearing on a new plaque, that will hang in the Department lounge (alongside the earlier plaque bearing the names of previous winners), the honor, which will be awarded each Spring during the Graduate School’s Honors Day convocation, also comes with a monetary award.